Small boarding cattery just off SH8. Handy to lakes and ski fields. Spacious individual rooms with enclosed outside courtyard. Mackenzie Area or anyone visiting the area. Please phone for availabili­ty. $12 per cat per night. The cattery is safe and secure, located next to the house in a quiet, yet stimulating environment. Bedding and food bowls are available if required. Dry cat food is included in the price although feel free to supply your own food. There are four individual rooms - each of which can house up to 2 cats from the same family. There is a large, enclosed courtyard for the cats to play in. Lots of individual attention guaranteed. All cats must be neutered, be up-to-date with annual booster vaccinations and have been wormed within the last 3 months. Thank you. We have a reserved cat that was not impressed with the house being packed up for our move. Knowing that we had Daisy Fields cattery was just great and Sharon was so sympathetic to Sophie`s need for physical contact. Where else would you find an owner who would take their morning cuppa with the cats! We were very impressed with the thought that had gone into the design of the cattery and every precaution has been taken to avoid any escapees. Thankyou Sharon! We have a very timid cat which arrived at the cattery, very distressed by the car ride. She was quickly settled into her spacious, sunny apartment and soon looking very much at home. Sharon has a wonderful manner with animals and I can highly recommend this cattery. I highly recommend this cattery serving the Mackenzie area. The new and beautifully appointed individual units are very clean, comfortable and reasonably priced. The owners go the extra mile in making sure your cat is well looked after and fussed over. Timaru cat owners who are holidaying in Lake Tekapo, Twizel or Queenstown, should look at dropping their cat off here on the way. Excellent cattery and Sharon is lovely. 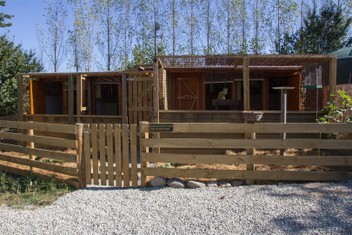 The cattery is very clean and well set up inside each unit. As our cat had never spent any time in his 10 years in a cattery before we gave him a 1 night stop-over the first time, then the next week, a 2 night stop-over before he spent 9 days over the Christmas period. Sharon gave him lots of love and attention and made him and us feel comfortable about leaving him. Thank you Sharon. He'll be back. We would highly recommend Daisy Fields Cattery.